The King having been pleased to turn out his late Ministers without either Rhyme or Reason, it behoves us to send to Parliament to represent us only such men as can and ought to be relied upon for their exertions in the glorious cause of Reform. You have had two Lords to represent you – Lord George Lennox has always attended to his duties and voted well. 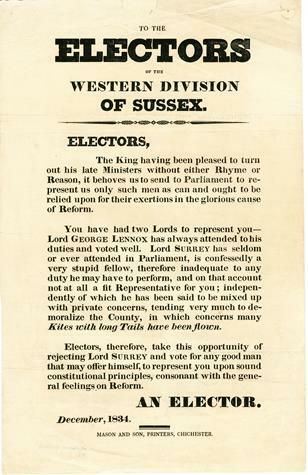 Lord Surrey has seldom or ever attended parliament, is confessedly a very stupid fellow, therefore inadequate to any duty he may have to perform, and on that account not at all a fit Representative for you; independently of which he has been said to be mixed up with private concerns, tending very much to demoralize the County, in which concerns many Kites with long Tails have been flown. Electors, therefore, take this opportunity of rejecting Lord Surrey and vote for any good man that may offer himself, to represent you upon sound constitutional principles, consonant with the general feelings on Reform.